Now the question is what to do with all that pork. You certainly could roast the entire thing, but unless you have a huge family or a big get together then you are better off cutting it into more manageable chunks. I slice mine up for two purposes: roasts and butterflied pork chops. 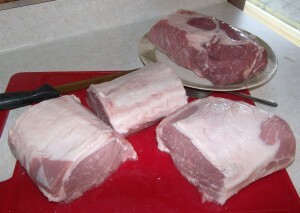 As you can see in the picture above, there is an area of less fat towards one end of the loin. This end is closer to the sirloin part of the loin. This is what I use for pork chops. The fatter pieces are better for roasts, because when roast fat side up, the fat basically bastes your roast for you. Since it’s only my wife, my 21 month old daugther, I decided to cut three small roasts and leave the rest for pork chops. I took my three roasts, cooked one up immediately for dinner that night, and with the other two, I wrapped them tightly in heavy duty alunimum foil, placed them into a gallon size plastic bag, and put them in the freezer for later use. Now to deal with the rest of the pork. I had roughly 9-10 inch long piece left. So I sliced it into 4 pieces (I would have done about 6-8 if I wasn’t going to butterfly them). To butterfly them, I cut the chop in the center almost all the way through and then opened it up, kind of like a book. I like doing this for when I make breaded pork chops as it creates a greater surface to mass ratio and that helps with the cooking time. Of course you could use these chops for anything from grilling or searing. I typically don’t like using boneless chops for slow cooked receipes because I think the bone provides flavor and I cook them enough so that they fall off the bone for easy eating later. Take the time and save some money by cutting up your own pork roasts and chops. It’s one of the best decision you could make in a grocery store.